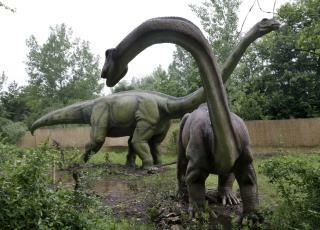 (Newser) – Dinosaurs were already past their prime when a huge asteroid finished them off 66 million years ago, according to Universities of Reading and Bristol researchers who say their work "changes our understanding of the fate of these mighty creatures." They write in the Proceedings of the National Academy of Sciences of a decades-long debate: whether the creatures were "reigning strong" or "in a long-term decline" before that "final catastrophic event." They say they have for the first time used a statistical approach that allowed them to model the "the evolutionary dynamics of speciation." What they've found is that dinosaur species were going extinct faster than new ones were emerging for as many as 53 million years before the devastating impact, with other factors—including volcanic activity, the breakup of continents, and even our small, furry, egg-eating mammal ancestors—contributing to a long, slow decline. its all a big lie. God created the earth and everything in it. I don't know why they keep saying dinosaurs went extinct. I ate a dinosaur just the other day. Tasted like (and was) chicken.